As regular readers know, I grew up in Texas. It gets hot in Texas! I used to consume snow cones and Slurpees like they had no calories as a kid, because they offered up temporary relief from those oppressive summers. While we have seen nary a day over 80 degrees in Seattle this summer, I can still appreciate a good snow cone. 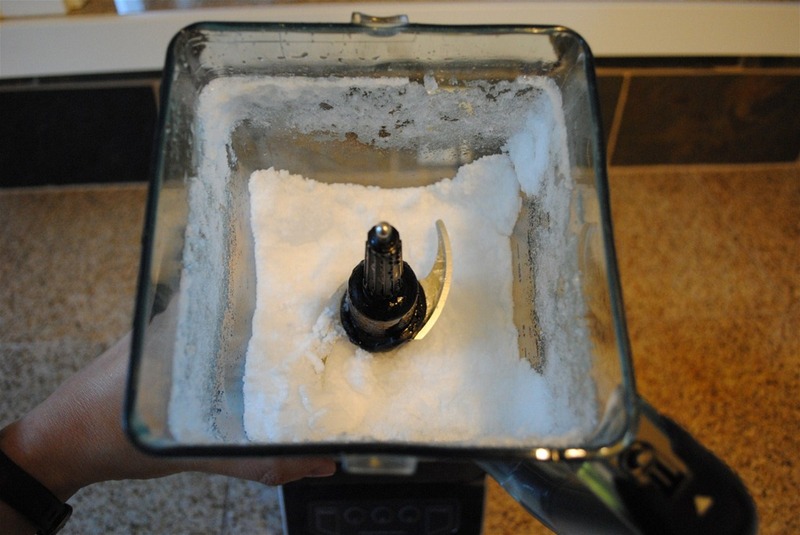 So, when a commenter left a question on my Ninja Blender review about the blender’s ability to make “snow,” I had to try it out and see if it was possible. On a side note, I admit to having never seen the Ninja blender infomercial before I bought one. I get quite a few questions from people thinking about buying one that reference things done in the infomercial, and this was no different. However, yesterday in the wee hours of the morning, I happened to catch this famous infomercial. It pays to be an early bird, I guess. In the commercial, the “host” has a full blender jar full of ice that he proceeds to turn into snow in no time. I really wasn’t sure if this was possible, so I loaded up the blender jar and gave it a shot. As with everything Ninja, more is better for better blending consistency. It does best when the contents mostly fill the jar. There is nothing in there but ice. It made way more than 2 cups of snow, but I just wanted to show you the consistency in something other than the blender jar itself. I think that is pretty cool! With a little flavored simple syrup, you have a homemade snow cone! 🙂 I have not tried making snow yet in my NInja … will surely do. In India the “snow” used for snow cones is very smooth, much like the real just fallen fresh snow, unlike the “snow” used in snow cones one buys here, which is more crystallized I think. I am sure Ninja will deliver a really nice smooth snow!! Thank you for sharing this .. brought back fun memories from India! Just got my Ninja. Want to make the snow but was wondering if anyone knew how fast that will dull the blades and how can I get them sharpened. Enjoying recipes….thank you! Thanks for sharing your experience. If you’ve had your Ninja less than a year, I’d suggest contacting Ninja directly. 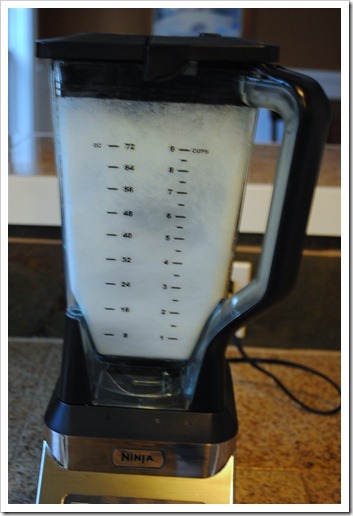 Your blender should still be under warranty, and I would ask if they can send you a new blade for free. It’s worth the ask! Just did this for my girls and poured on some snow cone syrup. They loved it and I loved that I didn’t have to leave the house for it! we have the big and small blender. i have found the small blender with the 2 blade assembly is dullign up and not chopping up ice or anything as fine as it did even a few months ago. rather large peices of ice left even after blending for several minutes. the smaller unit is more convenient for single drinks like a post workout smoothie. not sure if there is a sharpening tool for the blades or maybe i should only use the large unit? Hmm, that is not good. I would recommend contacting Ninja customer service and asking them for a replacement — that should definitely not happen!! I agree that the single serve cups are more convenient for post workout smoothies. Good luck – let us know how you make out with the Ninja folks. I just purchased my Ninja system and the first thing I did was make snow. One of the many reasons I bought it was for this feature. We live way out in the country, but I sure love a Starbucks Frappe. Sometimes I am in the mood for one, but don’t want to drive to go get it. This makes the most wonderful snow, so I can make homemade frappes. I also cleared out many of my electric kitchen items, and am ready to sell them on one of the Facebook selling sites. I am very pleased with my system and look forward to using it for many other things. How great that you can make your own Frappes now! I’m sure other readers would love to hear your recipe, if you wouldn’t mind sharing it. I just got the Mega for Christmas and was ready to make ice cream! I thought on the commercial it was Strawberries, Bananas and Milk, or Peaches and Milk. I tried to google the recipes and found this site! Im glad I did!! Instead of ice cream because I didnt have any heavy cream, we had snow cones! It was AWESOME!! My daughter now calls the blender hers (and shes only 6 years old!! I had originally bought the 40$ one on sale at Wal-mart and used it for the instant strawberry ice cream all the time. It also made awesome bar like frozen drinks, but not snow quality. 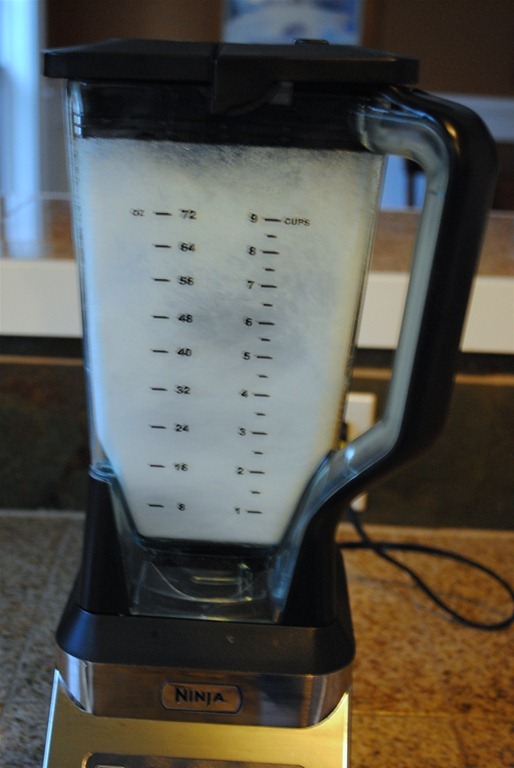 It blended ice much better than my old traditional blender but it wasn’t as fine as on the infomercial. My husband just ordered the mega system for a gift and I can’t wait to make snow. So glad to see comments on here confirming that it really does work! Hello all, I just won a Ninja Pro Stackable Chopper NJ1006 in a raffle from M & M my health food store. I didn’t even know what it was but when I got the call from one of the ladies at the store, she was so excited I couldn’t wait to see what it was. I called my sister to tell her just that I won something and she was really excited; first thing she said was you can give away your Magic Bullet and put your vita-mix in the pantry for awhile cause this is the best. I haven’t tried snow yet but made myself a protein drink with Vega van. chai; raw spinach; coconut milk and lots of ice. Pretty good (alas,much better than my bullet.) Now, where do I find recipes for this magnificent chopper. Please? 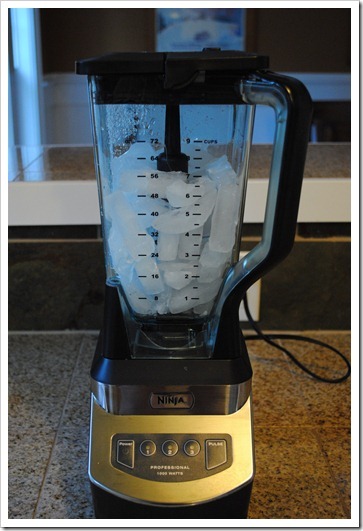 You can make pretty much all of the recipes on my Ninja Blender Recipes page with your Ninja Chopper. It’s a lot like the Ninja Pro Blender, but in reverse with the motor on top instead of in the base. I don’t personally have one, but my brother does, and he loves it as much as I do the Pro Blenders from Ninja. Have fun! I just had my mom purchase the Ninja Kitchen System for me for my birthday on Thursday and I’ve been using it like crazy the last few days. Already put my magic bullet in the basement and want to go ahead and do the same with the kitchen aid but mom and grandma aren’t ready to take that step yet (even though we really barely use it). Can wait to go through your recipes!!!!! My Kitchen Aid is the only small appliance I haven’t stopped using because I make cakes and the Ninja doesn’t do frosting as well as the mixer. Also I have a large family so when I do bread the batch is too large for my Ninja. Can I use regular ice cubes in my Ninja mega single serving blender cup?? You definitely can. If you are trying to make snow, just watch it carefully because you can go from snow to liquid pretty quickly in the single serve cup. 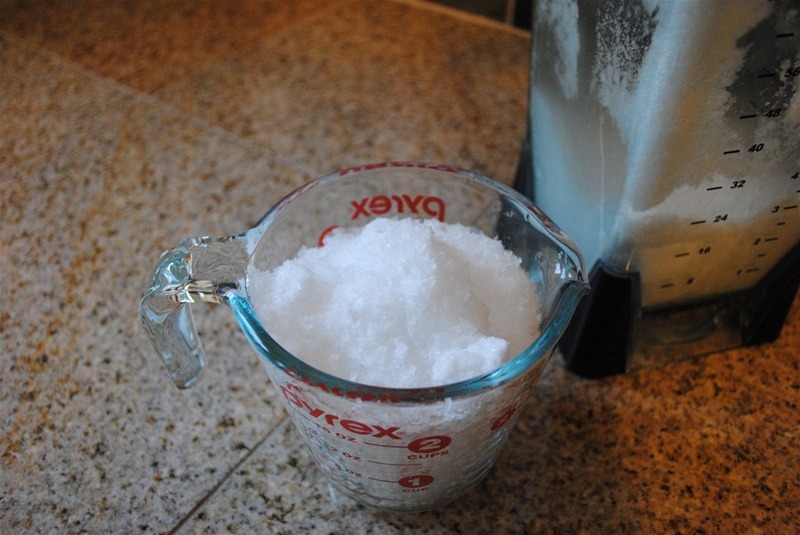 If you want snow, I would recommend using the large pitcher, but if you are asking if you can add ice cubes to the single serve cup for smoothies, etc., yes, you can. I searched for a website, like this, because my Ninja Ultima made perfect snow when I bought it about a month ago. I use it everyday with either ice or frozen fruit. However, the last two times I hve tried to make snow, the ice caked around outside edge and ice cubes lodged into the snow without being “blended.” I was wondering if anyone had same experience after about a month. I do not know if the blades are not as sharp or if there is another explanation. 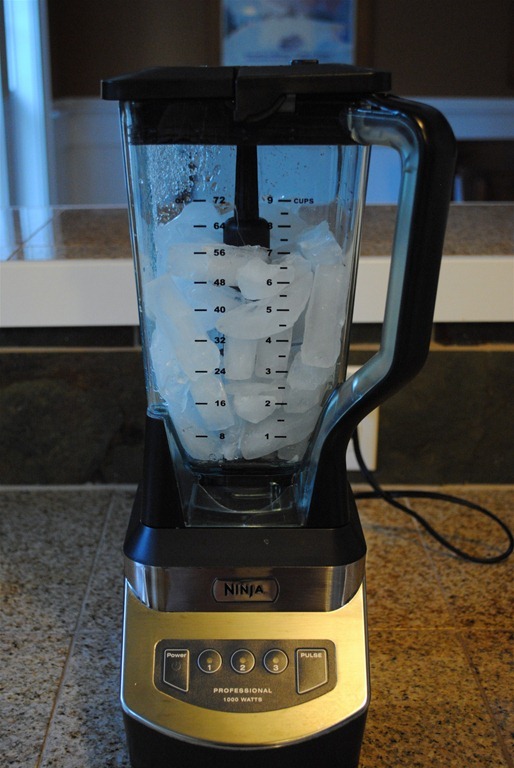 The people at Ninja blenders were very nice, sent me another pitcher for my ultima with a new set of blades installed. I swap out the two pitchers just to be sure that I am not wearing them out too fast. This was the best support team I have ever worked with. The pitcher with new blades was free. I didnt even pay for shipping. I am loving your site, I just got the mega yesterday and already made so much in it, being in Australia though we don’t get a few of the accessories that other countries get nor did it come with very good instructions but your site has helped me out so much already 🙂 google has been my new best friend when it comes to conversions or working out our equivalent to an ingredient. Have had our Ninja a year in April. Blades dulled after 6m of daily use. Dulled to the point smoothies were quite thick, chunky & gross. Now once a month I sharpen each blade with a knife sharpener in about 15m. WEAR A WORK GLOVE! Huge difference, like new. Unless you must, skip the ice cubes and stick with ice cold water for prolonged sharpness. I live out of the country, been looking for a snow cone machine here. Imposable too find…Been thinking about using a heavy duty blender for my business. How do you think of the durability of the nija. I wouldn’t say this is your solution for a commercial situation. I have heard that the blades do get dull over time if using it make snow too often. Sorry to report! 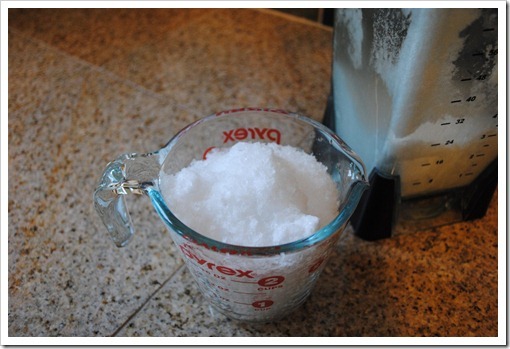 Stumbled across your blog when looking at how to make snow from ice. 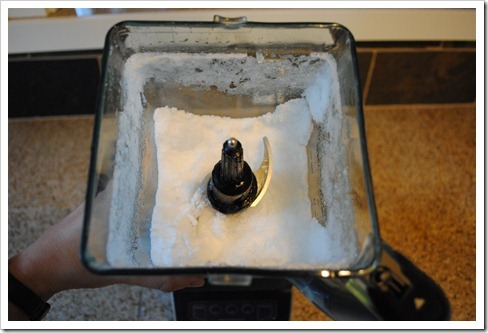 I’ve just purchased the Ninja blender for the sole purpose of making snow. However it keeps ending up very crystallized, crunchy and tends to stick together in big lumps. Does anyone have any advice on the best way to use the blender for making snow or the best types of ice cubes?